Two paranormal investigators receive an invitation to Richmond Manor, a haunted house who's ghostly inhabitants have been responsible for countless gruesome deaths over the years. On their arrival they are greeted by a mysterious man who informs them that they have been chosen by the owner of the manor to uncover the truth about these murders and offers them the princely sum of fifty thousand dollars each if they are successful. The two men have never met before and probably never would have under normal circumstances. Jack Donavan (Michael Koltes) uses science and technology to uncover frauds and disputes the existence of the paranormal, whereas Jonathan Blazer (Paul Flannery) is a medium and a bit of a showman to boot. Can these two work together and put their differences aside to beat the evil presence that resides within Richmond Manor?...... They have three nights to figure it out. Filmed on location in Scotland at a very stunning manor this has a lot of good things going for it. It is another haunted house story that is a bit predictable and uses most of the usual jump scares: slamming doors, flickering lights, symbols in basements and a ouija board but they are all put to good use. Even though you are expecting it you still feel a bit on edge. A lot of it is down to the fantastically eerie, often 80's synth influenced soundtrack throughout which is brilliant and adds a lot to the tension. This is composer Niall Mathewson's first movie soundtrack and hopefully not his last as I loved it all. The end credits features a track by Scottish 80's prog rockers Pallas (incidentally Mathewson is a member of the band) which on any normal occasion wouldn't quite be my cup of tea but it's a great track that really fitted in well. The other great thing about this movie is the characters. Finally a movie that has actually succeeded in creating likeable characters (they seem a bit thin on the ground these days!). Not all of the acting was brilliant, it has its wobbly moments but I found them easy to overlook . Michael Koltes and Paul Flannery work well on screen as two completely different people struggling to find common ground and get on with the job at hand. Koltes is a bit awkward at times but I have developed a lot of love for Flannery and his character. This is his first movie as he is more known for stage shows and theatre productions which really shows in his deliverance of performance but I really hope he goes on to do more film acting. His character kind of reminded me of a cross between Brian Blessed and Johnny Depp as Jack Sparrow which, granted, sounds awful now I've written it down but trust me it was a great performance. 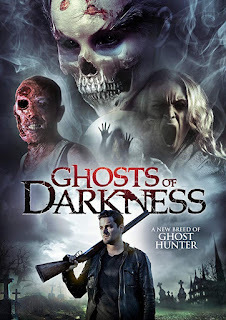 The down sides to Ghosts Of Darkness are that given it has an eerie feel to it on the build ups it never really follows through with the final scares. The ending is a bit of an anti climax not helped at all by a very subpar CGI demon which really should have been a lot better. The other special effects are pretty good with some of the deceased characters coming back as zombie/deadites that look and sound great which makes up for the bad CGI. This is the third feature film from Scottish director David Ryan Keith. His first being zombie comedy Attack Of The Herbals (2011) and then slasher The Redwood Massacre (2014) the latter of which won a couple of awards. I am yet to see either of these but going by Ghosts Of Darkness I am very keen to see more of his stuff. This is an enjoyable movie which I liked way more then I expected I would, not particularly scary yet kinda creepy, well shot, with great characters. It's definitely one to check out.